This clean, quiet property is on 1 acre of land located just over the Hillsboro Bridge and a 5 minute drive from downtown Charlottetown. It has a view of the water from the front of the home and also from the back patio. There are 3 bedrooms in total, two bedrooms with a queen size bed and one bedroom with a double bed. There is a TV located in each bedroom. This home sleeps six people. There is a ½ bath off the master bedroom containing a walk-in shower. The full bath is located at the other end of the home, being close to the other two bedrooms. The large sunny eat-in kitchen is fully equipped. The living room is decorated with leather furniture and a 60 inch HD TV. The large patio which faces the beautiful Hillsboro River sports a 6 person Hot Tub, patio table, chairs, and a barbecue. The beautiful city of Charlottetown and surrounding area offers live theatre, dinner theatre, golfing, horse and carriage rides, shopping, great dining experiences, nice quiet walks on the Confederation trail, walking or biking on the boardwalk and much more. 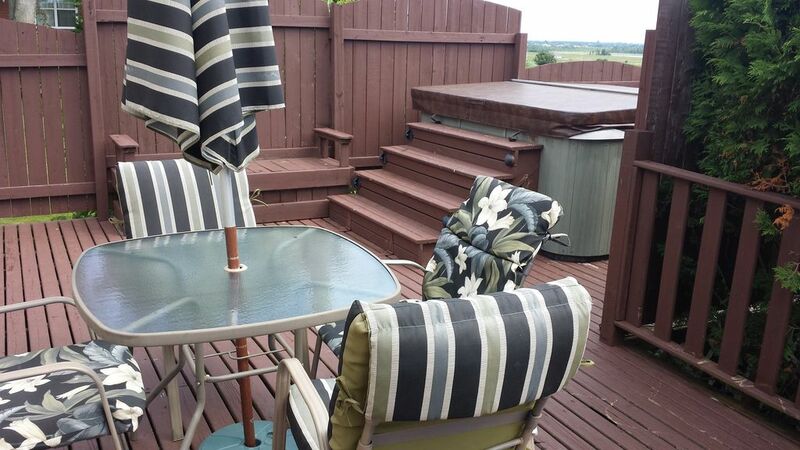 very clean,large home ,very comfortable furnishings,5 minutes to down town Charlottetown.everything you need is close by.had a 6 night stay without any problems.I would highly recommend this home and would stay there again. Air conditioning and a hot tub! Great location. Had everything we needed and more! Nice yard for the dog and we enjoyed the hot tub. Had an issue with the heat pump/AC but it was sorted quickly. We loved it at Troy's place, great location, had everything we needed, terrifically helpful to have everything on one floor, charming, and definitely a return destination for us. Troy could not have been more helpful or responsive with any questions we had. We hope to see you in 2018, thanks, Troy! We thoroughly enjoyed our stay at your home. The home itself was very clean and modern and it had all the amenities that we required and then some. The property was very tidy and well kept. The neighbourhood was very quiet and peaceful with no indication that we were only five minutes from downtown. I was very impressed that the owner contacted me on our first day to make sure everything was satisfactory. I especially enjoy the beautiful from the back deck while relaxing in the jacuzzi. We will definitely be adding your home to our itinerary for our next stay in PEI. Thank you for helping make our stay a very enjoyable one. We came down for a wedding and stayed here for 2 weeks, and couldn't have asked for a better place, myself, wife and 3 kids enjoyed how close to Charlottetown it was and short drive to everything including the beaches. The hot tub at night after the day at the beach was great. I would recommend this place to anyone looking for a great getaway but still close enough to town for all you need.